It’s dipping into the 30’s for the second time tonight, so my husband Daniel built our first fire for this season in our wood burning stove. 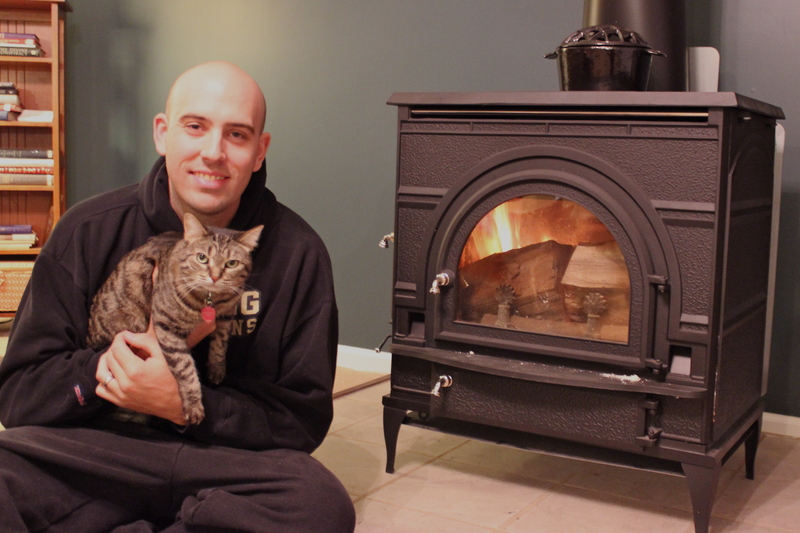 We were so excited to sit next to the fire with our cat, Abby. So I just had to capture the moment. the battery in my external flash was dead, so pardon the over-exposure, poor quality. My editing skills are rusty. I have been itching to do baby-related shopping; but for one reason or another, have put it off this whole time. My husband and I are both so hesitant when it comes to making purchases for our lil’ peanut (that’s what we call … it). I’m not sure why the hesitance. At any rate, this past weekend we decided to take one of my friends from work who is expecting her second child up on her offer to meet us at a consignment sale on Saturday morning. The sale took place in a middle school gym on the east side of town. The group who hosted and sponsored goes by MOPS or “Mothers of Preschoolers”. You might have heard of it. MOPS is a national not-for-profit organization divided into localized groups throughout the country consisting of, well, mothers of preschoolers (and younger). It’s a way for women of all backgrounds who have little ones to get together, have play dates, and be around other women they can identify with. Great concept. An infant section (positioners, bedding, blankets galore, bottles, food processors, food storage, socks, bibs, boppy pillows, infant carriers, breast pumps, diaper bags, stroller accessories, etc.) Can you tell this is where I spent a lot of my time? There are consignment shops or businesses, where you can get a good deal on children’s items, but they are still trying to make a profit off of their sales. These particular sales are not formatted to make a profit; but to help MOPS members clean our their basements and garages, raise money for their organization and mothers in need, and allow the public to buy items for a true bargain while supporting a good cause. It’s a win for all. And it’s a great resource if you know someone who cannot afford to buy things full-price or for business bargain prices. 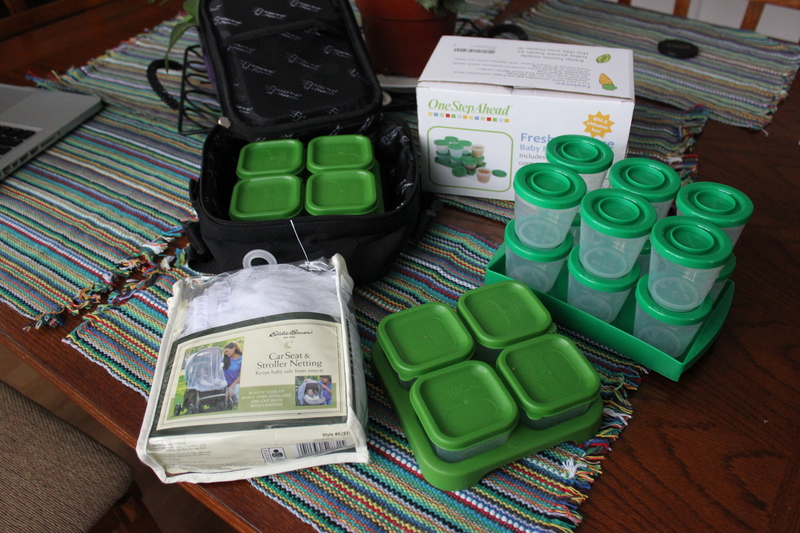 Now, as future parents there are certain items my husband and I do not feel comfortable purchasing even gently used, but on Saturday we were able to find some great items we payed next to nothing for. 1. We were thrilled to purchase our first piece of nursery furniture: a rocking chair! The one we bought is identical to the picture, down to the lovely blue velvet cushions. It’s made of real oak, and is basically brand new. As soon as I sat in it I said “this is the one”. You see, I’m petite. Very rarely do I find a rocker, recliner – any furniture piece meant to be sat in – that I am comfortable in. We were unable to find a retail price online for this chair, but my husband says a quality piece of furniture like this probably goes for about $300. We bought ours for $40. $40! We didn’t even mind stuffing our used, honey tinted oak, petite-friendly rocker into my small 4-door car. I took the back seat gladly. Needless, to say, it will need some major overhaul including sanding, painting, and new cushions. We don’t mind any of these activities! Customizing is our thing. When the rocker is fully renovated I will post a before and after entry detailing the fun we had with it. 2. A random assortment of things we were planning to register for, but bought on consignment because they were just too good to pass by. Success! Find your local MOPS group! I have had intentions of updating my blog for a long while, but have not had the time to sit down and actually do it. Work and life seem to take up all of my time. But today I felt motivated and ready to get this blog rebooted again. You see, I’ve been really giddy lately. The culprit behind such embarrassing giddiness is so big and yet so small at the same time. It’s the size of a tomato to be exact. You see, on June 19th of this year, I peed on a stick and screamed bloody murder which resulted in my husband running to the bathroom with eyes the size of baseballs thinking I was dying. You see, I’m pregnant. I think the reason behind this long blog hiatus has been a true journey. My silence is deeply rooted in a mixture of fear, respect for the intricate delicacy of pregnancy, and a little slice of humble pie. I miscarried this past March, and almost simultaneously several fantastic women around me also lost their babies. All of them are lovely women who love their husbands, and want so badly to raise healthy families. The stork was on strike, and I felt possibly more disheartened than I’ve ever felt before. I begged God for that peace He says only He can give and that I can’t really understand fully. He was generous to my husband and I. I felt at peace. The thing that kept me sane (because reasoning with God on the injustices of life, can drive one to madness and loss of mental capacities), was the realization and constant reminder that there is a bigger picture in everyone’s life. A picture that God ultimately molds into something more beautiful than anything we could possibly imagine for ourselves. And I knew that was a truth for me, and all of the people suffering around me. Taking the focus off of my own pain, and placing it on all my friends and co-workers who life had not been gentle to was essential in my recovery. My past experience with pregnancy has taught me so many valuable lessons. Besides growing my faith in a God I don’t always understand but always always always trust, I learned the true fragility of pregnancy. I learned to respect how easily, from one day to the next, it can all be over. But I guarantee you, a lesson learned means another struggle – I mean, chance for growth lays ahead. And for me, that struggle, was fear. Oh the tangly webs we weave in our lives, don’t we? I was filled, spilling over, losing sleep, with fear that this horrible and emotionally and physically painful experience would repeat itself again. I detached myself from this pregnancy for the longest time. It was almost a coldness I felt at first. I took care of myself and did everything I needed to do, but that’s where the care ended. I didn’t talk about it, and tried to put on a happy facade when it was time to tell our closest loved ones early on. The fact that I went through terrible nausea, weight loss, and a dysfunctional sleeping pattern my first 9 weeks kind of helped in keeping me disconnected from the being inside of me. I was terrified, and this is how I dealt with it. I didn’t even talk to God about my distress for fear that His answer would be “no”. I knew if His answer was “no” it would be “no” whether I asked it to be “yes” or not, because whether or not I actually talked to Him, He knew what my deepest desire was. He heard what I couldn’t put into words, and I wanted no other picture for my life, but the one He is painting – even though at the moment I wanted this one pixel of the picture to go my way so badly. As my first trimester came to an end, my fear gave way to humility and a hesitant gratitude. A very tiny change began inside me. I was at the same point where the pregnancy of a few women around me had come to an abrupt end. I continued to remain detached, and prohibited myself from dreaming; but I was humbled when I woke up every single morning still pregnant. I would sheepishly whisper “thank you”, and go about my day. I am still humbled to this very day. Because 19 weeks into this experience, my now tomato-sized bundle of joy is still with us. But until I hold this baby in my arms, I will continue to take things one day at a time, thanking God for giving me one more day with this little person, and humbly dedicating my joy to all these wonderful women I keep talking about. My heart goes out to every single woman who has lost a child, especially during pregnancy, and to all of those who are still pregnant. The final and lifelong lesson: humility. I will never stop being humbled. Humbled of being pregnant, humbled of being a mom, humbled of whatever comes. I want humility to be THE constant disclaimer of all my future entries regarding my preparations for a new family member. At this point, fear has given way to hope. So please share in this experience with me. This pregnancy may not succeed, but as long as God keeps answering “yes” in the morning, I will be happy.